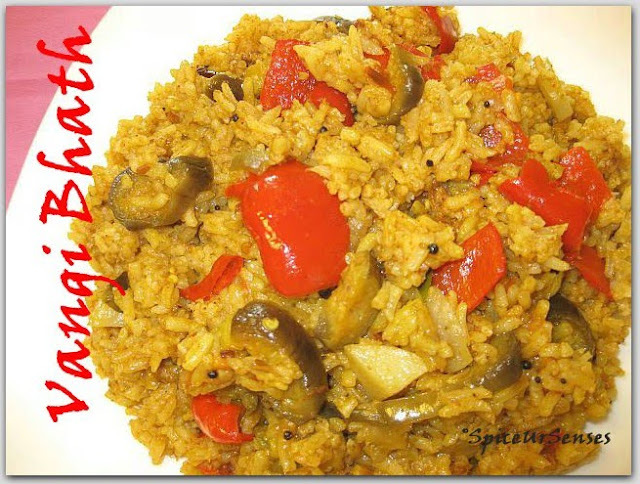 Vangi Bhat is a delicious one pot meal. 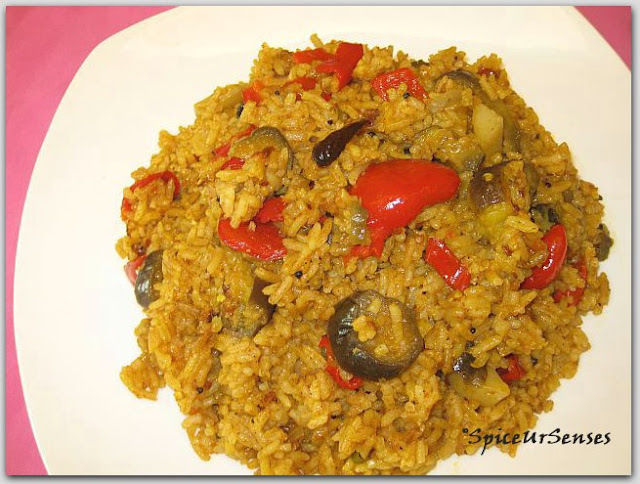 It is a wonderful combination of eggplant and rice combined with lovely aromatic spices. This is a typical Maharashtrian specialty but enjoyed throughout Southern India as well. Usually Vangi bhath is cooked with Eggplant but i like to add some other vegetables also like capsicum, potato, green peas. One of colleague use to bring vangi bhath for me in lunch, when she cooks vangi bhath she use to call me and say dont bring lunch today, because i have prepared VB. She was an expert when it came to cooking this dish. Whenever i would visit to her place, this dish was made. And she use to serve me with home made papads (crispy then lentil wafers), it was a wonderful and delicious combination. When i was cooking this dish i was really missing her alot. Iam waiting when i'll go back to india so that even i can cook VB and serve her in the same way, which she use to do it for me. Take a broad pan and heat oil. Fry 3 dry red chillies, gearlic cloves, cinammon, coriander and peppercorns, for 5 minutes. Grind them to form a fine powder. Heat ghee in a pan and add mustard seeds, urad dal, 2 dry red chillies, green chillies, onion and turmeric, stir it till the seasoning is done. Add the brinjal, capcisum, potato pieces and little bit of salt fry for 20sec. Add tomato, lemon juice, powdered masala, and mix them together properly. After that add water and check for salt, add salt if req. Then add rice and mix together gentely, cover the lid and cook till the rice is completely cooked in a medium flame. Delicious Vangi Baath is ready to serve. never tried.. thanks for sharing! looks delicious. Delicious rice..love eggplant in there..
Hi RUmana, thanks for ur beautiful comment...am here for the first time and u have a beautiful space...vangibath looks awesome and delicious..
Looks delicious .I like the way u have cut brinjals. Thanks for dropping by our blog...Vaangi bhaat looks amazing..c u soon..